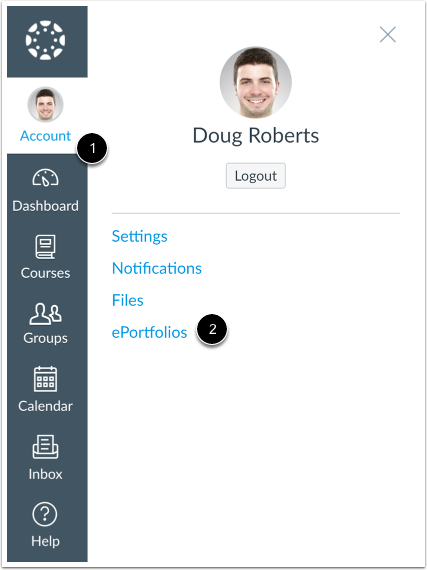 How do I create a new ePortfolio section as an instructor? 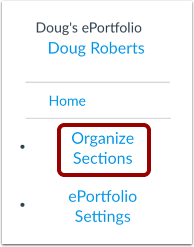 You can organize your ePortfolio by creating multiple sections. Click the Organize Sections link. 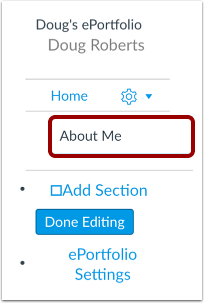 To create a new ePortfolio Section, click the Add Section link. Type your new section name in the section name field. Press Return (on a Mac keyboard ) or Enter (on a PC keyboard). To edit any section, click the Settings menu. To rename a section, click the Rename link . To delete a section, click the Delete link . To move a section, click the Move to... link . You can also rearrange sections by clicking and dragging them. 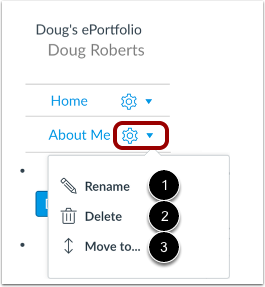 When you are finished adding and/or editing your new ePortfolio Sections, click the Done Editing button. Previous Topic:How do I create a new ePortfolio as an instructor? Next Topic:How do I organize my ePortfolio as an instructor? 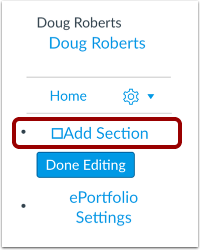 Table of Contents > ePortfolios > How do I create a new ePortfolio section as an instructor?